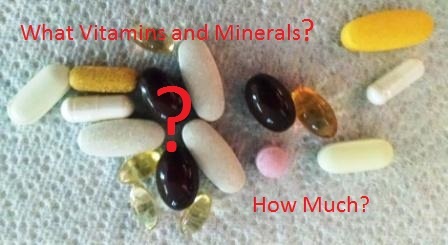 How much of which vitamins and minerals should we supplement with is always the question. It really depends on your diet. Following the guidelines of the National Institute of Health is very daunting. How are the guidelines developed? Is the recommended amount the correct amount for me? The guidelines are usually developed based on the Estimated Average Requirement (EAR) from studies with scanty data or from studies with limitations in addressing the questions. Then the Required Dietary Allowance (RDA) is determined by moving the amount two standard deviations to reach 97.5% of the population. As examples, consider vitamin C and vitamin D. If the requirement cannot be based on science, then it is just a WAG called Adequate Intake (AI). Guidelines for vitamin D were last issued in December 2010. The guidelines were stated specifically for bone disease or the amount needed to prevent rickets and osteoporosis. However, there was an egregious statistical error made. The Institute of Medicine (IOM) stated that 600 IU per day was adequate for most age groups and weight. It was later found that the IOM used averages for their regression analysis, which lead to the 600 IU per day. When using individual data, it was found that the amount should have been 10 to 15 times higher. This was confirmed by Creighton University and UCSD in February 2015. The government has taken no action to correct this error. The point, ignoring the statistical error, is that the IOM only considered bone health and not the other benefits of having an adequate amount of vitamin D.
Bats, guinea pigs, and higher primates, which include humans, do not synthesize vitamin C. If we consider the dog and goat, the amount of vitamin C synthesized is amazing. Dogs make about 18 mg/d per pound body weight. A fifty-pound dog then makes about 900 mg/d. A 154 lb. adult goat will make about 13,000 mg/day. If we find an amount per pound body weight that the goat makes, we find a huge number at 84 mg/lb./day. This was the amount that the researcher Linus Pauling thought was correct and he consumed over 12,000 mg/day. He died at the age of 93. If we approximate the amount for humans at 180 lbs., we find that we should be getting about 3,500 mg/day. This is the amount that I normally supplement or about 2 to 4 grams per day. It only makes sense, given the above discussion of amounts, that the correct amount of vitamins and minerals are critical to health. Why then does the government only make RDAs as a distinction of gender and age? Of course, they are trying to reach an amount so that you do not have to do a calculation when trying to determine an adequate amount of vitamins and minerals for health. They use averages. This led to the error on vitamin D. Are we so poorly educated that we cannot do a simple multiplication? Why can’t the government simply state that we need an amount based on weight. I have seen many discussions about this issue in the IOM documents. However, it is mainly to stay with the “normal nomenclature.” It would be much easier to simply state an amount per mass and eliminate gender. Just think how much easier it would be if we stated vitamin D at 40 IU per pound body weight per day and vitamin C at 18 mg per pound body weight per day. It doesn’t fit the science claim the researchers that hold patents for prescription drugs. The most recent foray into drugs versus nutrients that I have seen is the use of a drug to eliminate opioid constipation. Two fallacies come to mind. First, there should not be the need for opioid drugs to reduce pain, especially chronic pain, if the patient was getting enough nutrients. I know this from three decades of pain. Second, to use a drug instead of an adequate amount of magnesium in an absorbable form is outrageous. A simple supplementation with magnesium citrate or soaking in a bath of Epsom salts (if you are vitamin D3 replete) should take care of the issue. In addition, this would improve your magnesium status to support the 300+ enzymes associated with magnesium. The major benefit of using magnesium to overcome constipation from opioids is that the side effects are health. With drugs for constipation, you have the adverse reactions of abdominal pain, diarrhea (if you overdo magnesium this may be an issue), nausea, flatulence, vomiting, and headache. Krispin discusses how much magnesium per pound body weight is required. Why hasn’t the IOM or the NIH given us this simple guide? Think about jeans for a minute. What if we picked the average size and the style with the minimum amount and type of fabric that would satisfy social norms as dictated by the government. Would anybody wear them? –Maybe in North Korea. PS: To those of you, who have listened to my five speeches on vitamins and minerals, be well and thank you.